Mom,Me and Alzheimer's blog: Another worry. 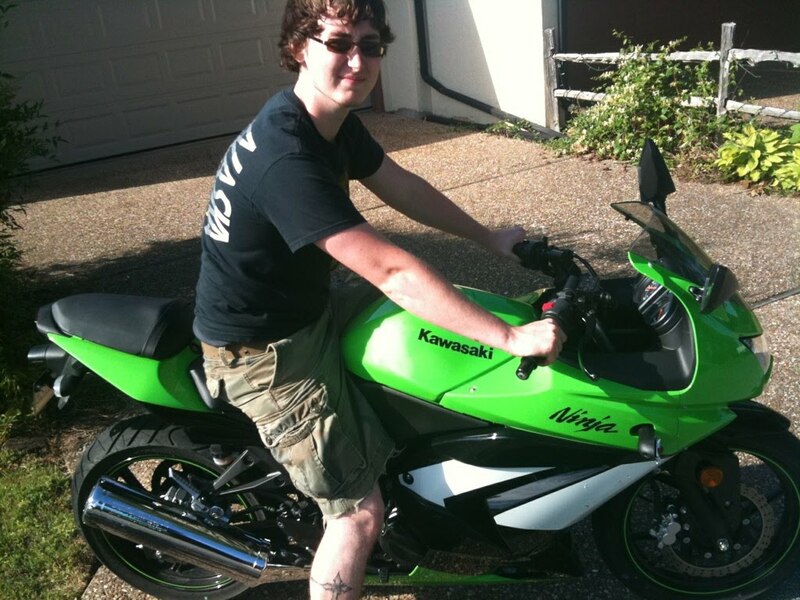 Just when I thought I had enough to worry about my son goes and buys himself a motorcycle. Great. This has been a busy week. My dishwasher is broke so I have been doing dishes by hand. Who does that anymore? And then the sewer backed up. There went $150 down the drain. When the plumber got it unplugged anyway. But I had one good day. My friend and I went out to eat, shopping here and there and than to the mall. Thanks Charlotte. Mom is in her easy chair . She is talking away. I answer her but we aren't really talking about anything. Maybe she is but I just don't get it. Since her feet have been blistered I have not been putting her in her easy chair much because I did not want to bust a blister. The last few days I started doing it more because almost all the blisters are gone . She doesn't seem to like it. She does not get comfortable and fall asleep like she used too. Getting her up and down is hard on her feet . They get bumped all the time. So she has been in bed a lot the last few weeks are more. I am trying to get her back on routine . It is not going so well. She got so sick all of a sudden than it takes so long to get her back to normal. We are getting there .Slow but sure. Bikes--ugh. But both my young brothers had them and survived. I think my 60yr old still rides his Hog. Good to hear from you, I was concerned about you. Your son doesn't have a helmet on in the picture (handsome son)....I hope he wears one when he rides his motorcycle. Oh, it's such an irritation and expense when things break or get stopped up.... , but I'm so glad you could get away for a day of fun and relaxation. Sorry to hear things aren't going so good. Hope today is a good one for your mom and you. I had the same reaction to my oldest son buying a motorcycle ~ when he was in his early 40's!!! He still rides (almost 50) mostly on the weekends on the rural roads around Atlanta and into North Carolina. Don't worry ........ he'll be fine. Hi Karen: Seems if it's not one thing, its another eh? By the way, I love washing dishes by hand....I find it soothing...and I let God dry them! Besides, dishwashers are sooo noisy! tee hee Hugs and enjoy each day! I have been washing dishes by hand for about 4 years now...I have seen my mom wash the dishes before putting them in the dishwasher..so I figure I am saving time. Glad you take time outs for yourself. OH MY good luck on the worry bout the bike.. Has Hospice given you any cream to put on her feet,, and let her feet hang past a pillow rolled behind her calves.. that seems to help a bit. Keep your chin up! A helmet all the time. Yes indeed. My mom used to wash dishes first before putting them in the dishwasher too. So funny. Great idea on the pillow trying it right now. Thanks all. Just wanted to let you know I was thinking about you. Hmm, I cant say much about the bike, in light of what happened to me last fall on the scooter. Ugh. Wear a helmet always. I must admit it looks like a beautiful bike anyway. The routines for your mom are important and as you know, they evolve and shift over time. your flexibility, and patience is amazing, just when you think you don't have it you find a little more, deep inside from somewhere. Keep the faith please.-I know you do. Thanks. I remember reading about the scooter . Very scary. Yes he wears a helmet. I pray he alway does. Karen, go to this page read, a surprise is at the end!